1. 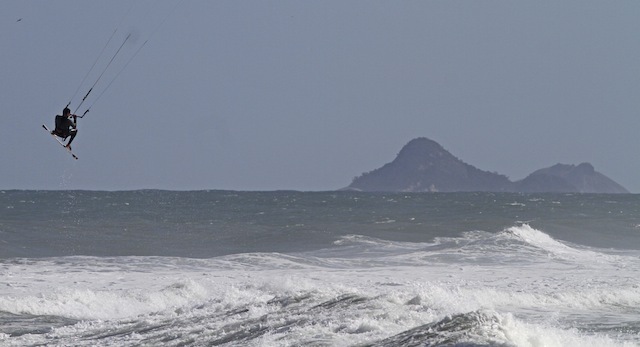 Kiteboarding will be an Olympic sport starting at the 2016 Rio Games. 2. It replaces windsurfing, which is currently (apparently?) an Olympic sport. 3. Baseball won't be played in the 2016 Games either. But, again, kiteboarding will. Kiteboarding. 4. "That was a big decision and a very sad day for windsurfing," Nick Dempsey, Beijing's fourth-place windsurfing finisher, said on Facebook. 5. It is more difficult than you think to ascertain the differences between windsurfing and kiteboarding via Internet search. 6. WordIQ had the best definition of the former: "Windsurfing (also called boardsailing) is a sport involving travel over water on a small 2-4.7 meter board powered by wind acting on a single sail, that is connected to the board via a flexible joint. The sport is a hybrid between sailing and surfing." There are three disciplines — match racing (one against one), fleet racing (mass start) and windsurfing — and 10 classes of boat. Competitors contest 10 races (15 for the 49er) with points awarded depending on finishing positions in each race (1 point for first, 41 for 41st). Each boat is allowed to discard its worst score and the ten boats with the lowest accumulated scores qualify for the medal race, where points scored are doubled and added to the opening series' scores to decide the top 10 positions. In match racing, the first boat across the line wins the match. Teams compete against each other in a series of round robin matches, with the top teams progressing to the final knockout stages. 7. Kiteboarding is "the sport of riding on a small surfboard that is propelled across water by a large kite to which the rider is harnessed," says Websters. It is expected to follow the same sailing rules during competition four years from now. 8. So the difference between kiteboarding and windsurfing is that one uses a sail on a board while the other is a board attached to a kite? 9. Once again: Baseball: not in Olympics. Kiteboarding: in Olympics. 10. An official at Yachting Australia told Reuters about windsurfers' disappointment in the decision but said he would encourage them to try the new discipline in an attempt to make the Olympics in 2016.